One thing that is often applauded by many is Southern Nazarene University’s push for students to obtain a new cultural experience during their studies. Different organizations and volunteers are constantly involved in making this happen. A big player in this is the music department at SNU, partially because music is so heavily influenced by cultures outside of the United States. This summer, many SNU music students will have the pleasure of traveling to Eisenstadt, Austria with Professor Jim Graves, choir director at SNU, and Dr. Richard Zielinski, Head of the Graduate Choral Studies at the School of Music at University of Oklahoma. This trip is part of the 39th Annual Classical Music Festival, which takes place around the beginning of August. 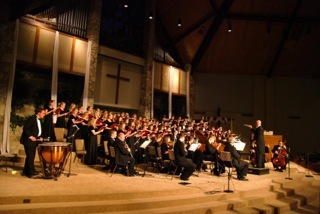 The choir, which is composed of SNU students as well as individuals from the University of Oklahoma, will perform Joseph Haydn’s Schöpfungsmesse, or Creation Mass, in St. Stephen’s Cathedral in Vienna, Austria. Haydn composed this piece in 1801, very close to the shift from the Classical Era to the Romantic Era in music history. This piece will not only be performed in St. Stephen’s Cathedral but also at the Esterházy Palace in Eisenstadt. This palace was constructed in the 13th century and was later obtained by the Esterházy family in 1622. It was later converted in a baroque castle and has stood in the hands of the family for over 300 years. Professor Graves touched on the history of this music and how it can come alive when sung in its original settings. The SNU Concert Choir and Chorale will be performing this piece at Oklahoma City First Church of the Nazarene on April 24 at 7:30. This is truly a spectacular piece of music that was written right at the turn from Classical into the Romantic Era of music. When true appreciation is given to something like this, it can really become awe-inspiring to think about. This trip is a once in a lifetime chance for these students, an adventure they will never forget.